It’s getting into mid-July, and we’re starting to get some good variety in the harvest, but not really high summer. Some exciting stuff is coming in – we’re harvesting lots of blueberries, cucumbers and zucchini are coming in strong buy we’re not sick of them yet, and the basil is really getting going. Wait a minute! Blueberries and basil might go together! I checked The Flavor Bible, and lo and behold, each ingredient lists the other. They both also strongly recommend lemon juice. Sweet, acid, and herby? That sounds like a cool salad dressing! Basil also goes great with mozzarella, so I made some fresh (it only takes 30 minutes). Parmesan as well, and onion. And we’ve got some great spring onions we’re harvesting now. Both basil and blueberries also favor spinach, so I made that the bulk of my salad greens. 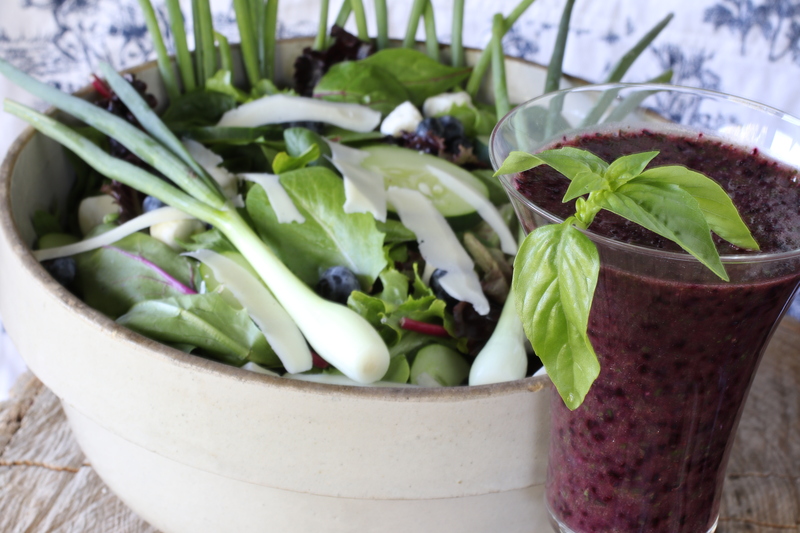 Toss some fresh blueberries in the salad as well, and serve with this dressing, and it was one of the best-received salads I’ve ever made, as well as a great celebration of everything local and seasonal right now! I also served this with my famous zucchini bread, but with blueberries instead of my usual walnuts. That was a hit as well! Basically, summer tastes good! This is an unusual dressing, celebrating foods that scream "July" here. It's also interesting for a salad dressing, in that it contains neither oil nor vinegar, nor a bunch of fat, yet still carries a ton a flavor. You'll probably want to spoon it over your salad, as it's a bit thick and frothy. Which is great! 1 C blueberries fresh. I'm not sure how well frozen would work. If you try it, send a comment :). Place all ingredients in a food processor. Puree. Thin with water as needed, and whir a bit more. When it's smooth and a bit frothy, adjust seasoning and serve. Because blueberries have a lot of pectin, this will thicken a fair bit as it sits. But because it isn't cooked, you can just stir it a bit and it will become fluid again.